Border Collies are my perfect dogs - biddable, medium size, beautiful, high drive, handler focused. But after an unexpected twist of events I live in New York City having landed an unexpected job. Specifically, I live in Gowanus, Brooklyn, and am currently DOGLESS. I'm trying to change that but I don't know what to do! My apartment does allow dogs but I want the dog to be able to thrive, not just not go crazy. I think a small dog might be best because I can bring it on the subway and go on adventures. The thing is, I really dislike poodle hair and wire coats - I want a smooth coated dog, preferably. Dog must be able to go on runs with me and do tons of fun tricks. All I've got is a JRT. Any other thoughts? To clarify, when I say I dislike small dogs, I mostly mean I dislike their owners who don't take responsibility for them. But in general I prefer more biddable dogs and I can pet them standing up lol. Ideas welcome. JRT? Rat terrier? Could I get a small field cocker on the subway? What don't you generally like about small dogs besides their size? Just so we have an idea of exactly what you are trying to avoid. Living in an apartment you'll likely want to avoid breeds prone to barking. How do you feel about a dog that needs to be professionally groomed on a regular basis (trimmed)? Does the dog need to be dog social (I know a lot of city people utilize dog parks so they need dog friendly dogs)? How much and what kind of exercise will the dog be getting? Terriers will be able to run with you and learn tricks, they like to have fun, but if border collies are your ideal I'm not sure how you'd feel about a terrier. They are not known for being biddable or handler focused. Some can also be quite vocal. Hounds are also not considered biddable, and scent hounds are quite noisy. For toy dogs papillons are quite active and fun but they are pretty darn small, so even with their activity level I'm not sure they'd keep up with you running. Also I think they're pretty vocal too. Spaniels might be your best bet but I'm no expert in the different breeds. They'll probably be the most active, least noisy, highly biddable option in small dogs. Of course they aren't all THAT small. The SMALL ones like cavaliers and tibetan spaniels are flat faced so probably a no go for a running partner. Next size up are probably cockers. Other than that...an active little mutt that fits your requirements is probably not going to be too difficult to find. mini aussie? Or pyrenean shepherd? You will likely have more luck looking for individual dogs which meet your criteria, rather than breeds which meet your criteria, if that makes sense? For example, I have 2 dachshunds which meet most of your needs (one is a barker, but wasn't as a young dog, the other is quiet in the house), but I wouldn't say they are the "norm" for their breed. That said, there are others like them out there, just as there are other small mixes or purebreds that would likely fill the niche of active apartment dog quite well. Your best bet, if you're not set on a breeder dog or known purebred may be to spend some time visiting local shelters and dog events, get friendly with shelter/rescue staff, and put the word out that you are looking for a dog with those traits. I find that experienced shelter staff tend to be pretty good at assessing a dog's general character, though you may get some dead ends. If you are more inclined toward a breeder dog, you can do similar with breeders who have dogs which otherwise appeal to you. Hi. 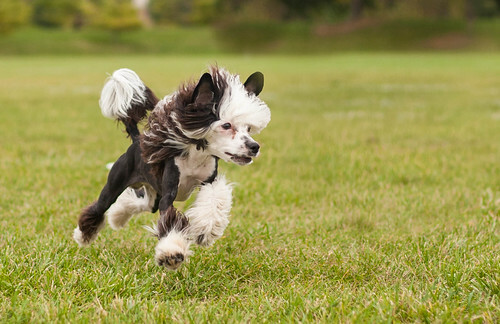 I have a cavalier and he is certainly able to jog. He doesn't have breathing issues like some other breeds. I know a few that are jogging partners too. I think a MAS or field line cocker could be a really good fit. What about a papillon? I was always a big dog fan, too; I always thought of small dogs as yappy little ankle-biters and didn't like the look of most of them, either (my opinion is different now that I've met many well-bred and/or well-trained little dogs, but that's how I felt for many years). When I needed to "downsize," I spent a lot of time researching the toy breeds to see if any would suit me, and I fell in love with the papillon. The typical papillon is everything I wanted in a dog -- biddable, handler-focused, active, energetic, healthy, and low-maintenance (although papillons have long fur, it does not need to be trimmed and they only need to be brushed once a week and bathed once a month or so). I ended up getting one from a good breeder and she is everything the breed standard told me she'd be. She learns new commands in around five repetitions, she loves to go on long walks (we've done six-hour hikes and she's been fine), she has never been sick, and she's attached to me but not to the point of separation anxiety. She can be barky, but she will quiet when told. She's not nervous and shaky, nor is she ever aggressive. I've met many papillons now and most of them are a lot like her. They're great little dogs. I love most dogs but if I were in your situation, I would get a cocker spaniel. They are great when living in an apartment and are perfect for the city life. Sports people joke [sport-bred] Paps are mini BCs. I'm biased . I can't even imagine a sports-bred papillon! I haven't met any, as I know mostly show papillon breeders. Most of their dogs are go-go-go enough! A few of them are quite successful in agility, as well. Many of the breeds people listed here are more medium sized and not going to travel easily on a subway. In NYC you can bring any sized dog on the subway in a hard carrier (and possibly even a soft carrier, I'm not sure), but it depends on if you want to be carrying a dog upwards of 20 lbs plus said carrier, which may not fit on a shoulder strap, through NYC. Although some tinier MAS might work, field cockers and whippets would definitely be pushing it. At that point I'd think a small female BC would be just as easy to take the subway with. My recommendation would be a poodle, except for the grooming. You can do their hair a lot of ways, however, and they fit your other requirements so well that if I were you I'd definitely reconsider if the hair is a deal breaker. Chinese crested was another thought. I don't think JRT is a bad choice, but they are very different from a BC, and I hesitate to recommend them as city dogs. There's not many breeders breeding for sports. But there are a few. Totally what I'd go for if I get another. Most also show but don't really sell many pups it seems. So maybe not 'sports bred' in the way BCs are but there's a few breeders who do a lot of agility with their dogs. I don't have much experience owning small breeds because I was never one that was interested in them. Then I got a Chinese Crested. I'm a herder person through and through and don't particularly like terriers but I really wanted a small dog to work with and the stars all aligned and I ended up with Hiccup, a powder puff Crested puppy. He's pretty much been a huge blast to play with. Lots of toy drive, especially for a breed not bred for it. Tons of food drive, loves to tug and the flirt pole. Chases anything I throw, currently playing disc with rollers. He's a little shadow and cuddle bug and really easy to take places which is super nice. He's also small enough that he's definitely a SMALL dog (around 8/9 pounds) but I don't feel like I'm going to break him and he plays with my other three no issue. But yeah, might be a breed to look into! JRTs on the other hand have no interest what so ever in being helpful. Unless there is something in it for them and they have nothing else on their doggy to do list. Wow you are so biddable said no one to a JRT ever. Though if you think you could laugh at an irrepressible, smart and tough little dog, then a JRT could work. I also agree with Cresties and possibly whippets. Paps are great, the only thing is if you are really active they are really small. But they tend to be smart, up for anything and fairly biddable. I'd probably look into an adult terrier mix or spaniel mix so there's no surprises on size and temperament. I also like Elrohwen's suggestion on MAS and again, would look for an adult that may already be accustomed to your lifestyle. Best of luck in your search! This couldn't be more true. A terrier couldn't care less what you want them to do. But I have learned to appreciate the free thinkers and oddly enough respect them and I find that all of mine will give back to me and what I ask. We have a partner ship of sorts. But there are times that my girls will shoot me a middle finger and do whatever they want. I do find that they ask "What is in it for me". Another thought might be Pomeranian or small (mini, you, or small standard) American eskimo. They're quite trainable as far as tricks go and should be up for adventures. My concerns with Pomeranians would be barking in an apartment and knee issues, and both breeds can be somewhat sensitive to extreme heat. I think one of the best dogs for your situation is a chihuahua of the techichi type. Good news....the best place to find one is your local pound. Techichis are a genetic throwback to ancestral stock. They run 10+ pounds as opposed to 3-5 lbs for chihuahuas. Typical techichi has a hard sand-colored coat, minimal maintenance. The muzzle may have a dark mask, and the ears are huge and batlike. They may have either the "apple-head" or the "deerhead" skull structure. They're so quiet that the early Spaniards to see them recorded that they were mute. They aren't, but they are very quiet dogs. They are clean, playful, intelligent, and loyal. They have a fairly high prey drive, but that can be diverted to an extent with toys that they can savage. Mine gets along fine with my cat (who is 2 lbs larger). They love to play but at the same time they're extremely calm dogs. They live 15-20 years. There are many ceramic effigies of chihuahua-type dogs from Colima, Mexico, to Georgia and Ohio. These dogs were obviously loved deeply, and once you have one you can understand why.